For quite some time the Cuban economy has been facing a number of economic problems. There has been minimal recovery from the near 80% collapse in the population’s real income levels since the suspension of the subsidies provided by the Soviet Union in 1989; in fact, the official wage rate remains at about 25% of its 1989 level (See Figure 1). Inability to produce enough food to feed the population. Very low productivity (particularly low labor productivity of the state sector). 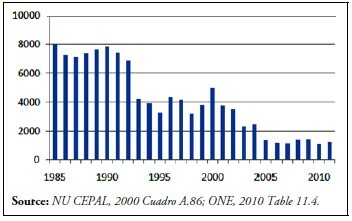 Exodus of young people coupled with significant aging of the Cuban population. Deterioration of the housing stock and lack of appropriate replacement. Deterioration of the country’s overall infrastructure (transportation, roads, railroads, ports, airports, water distribution and drainage systems, etc.). Large fiscal deficits covered by monetary injections. Large balance of payments deficits, which have resulted in suspension of the payment of external debt obligations. High dependence on imported energy and on foreign assistance. Prevalence of an overvalued exchange rate and a complex multiple currency system that makes it nearly impossible to determine the real profitability of various economic activities and results in all kinds of hidden subsidies and other economic distortions. Decline in the quality of education and healthcare. Beginning in 2009, the Cuban government found itself in a jam as the problems listed above intensified and Cuba’s rulers faced the worst economic crisis in decades. The Cuban Government became cashstrapped due low domestic production, the impact of three hurricanes that battered the island in 2008, the global financial crisis, lower tourism revenues, and declining earnings from nickel and other exports. Food production continued to fall; the sugar harvest dropped to the lowest levels in a century; international sources of credit dried up; and only the billions in subsidies from Venezuela’s Hugo Chávez kept the country afloat. In response, the government cut backs on imports, froze the foreign currency deposits of foreign firms investing and exporting to Cuba, and began to run into arrears in the settlement of its international financial obligations. But Cuba faced much more than a temporary economic crisis. Its state-controlled, centrally-managed economy was virtually stagnant and badly in need of change. As the government became increasingly unable to meet the basic needs of Cuban citizens, many individuals fled the country and those left behind had to turn to the black market, where products— often stolen from the state or sent in from abroad by the exiled community—are bought and sold. Under these circumstances the authorities saw the need to make a number of significant policy changes. Observers of the Cuban economy have been looking with interest at these changes, and in this ASCE Conference the opinions of some of them will be presented as to the appropriateness of the policies adopted to handle the problems facing Cuba. Here, I briefly discuss the nature of the problems, identify the policy measures proposed so far by the authorities to cope with them (including those contained in the Policy Guidelines approved recently by the Cuban Communist Party), and offer some preliminary evaluation as to the likelihood that these policies will help resolve the country’s outstanding economic problems. The first major problem of the Cuban economy that we will discuss is the lack of production and low productivity. This is particularly evident in the agricultural sector. In a system where decisions are strongly centralized, the authorities determine what crops to plant, the type of cattle to raise, and the prices that will be paid for products as well as for production inputs; they also control the commercialization and distribution of output. Under such a system, producers have no incentives to increase production and as evidence of this, agricultural output has been falling off for quite some time. The State Agricultural Procurement Agency (ACOPIO) holds a monopoly over most of the distribution and commercialization of agricultural output. It establishes the prices paid to farmers for produce and requires that the bulk of production be turned over to them. Poor management and bureaucratization within ACOPIO results in delays in the collection and commercialization of produce, including at the retail level, which in turn give rise to losses and spoilage. Often times agricultural products reach the point of sale in poor condition, but because of the existing price controls, sales prices are not adjusted accordingly. Moreover, there is a lack of capacity for the industrial processing of agricultural products, and those existing are sometimes obsolete, lacking proper hygiene and with very low productivity. Many economists blame the poor working of ACOPIO for the shortages of agricultural production, stating that the system neither rewards the best producers nor penalizes those who fail to meet production targets. Paradoxically, in attempting to control everything, the government has ended up controlling very little. The effectiveness of stricter state controls actually brings about weaker actual control as it promotes illegality, corruption and the ubiquitous violation of unrealistic regulations. Shortages of essential inputs, such as fertilizers and pesticides, and inefficiencies of the transportation, distribution and commercialization system contribute to hampering production. Output of some agricultural crops, such as sugar, which historically had been the mainstay of the Cuban economy, declined sharply as a result of mismanagement under State control (Figure 2). Before the coming to power of the revolutionary government, Cuba was an exporter of agricultural products such as sugar, coffee, meat, and vegetables. 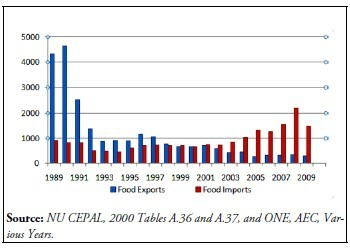 Currently, Cuba has to import most agricultural products (Figure 3). In fact, Cuba has to import an estimated 60% to 80% of the food its 11 million people consume. The United States has been the Communist-island’s main provider of food for years, supplying more than a quarter of all its foodstuffs imports, despite political tensions between the two countries and the almost five-decades-old U.S. trade embargo. Cuba gets chicken, corn, soy, wheat, pork and other products from the United States. U.S. sales of agricultural products to Cuba have dropped by 48% since hitting a peak of US $710 million in 2008. The reasons for the decline include Cuba’s lack of foreign exchange and greater reliance on commercial relationships with other countries— especially financial benefactors Venezuela and China. Also, countries such as Brazil, Argentina, Vietnam, Mexico, Canada, Russia and Iran have been granting credits or using barter to maintain or increase trade with Cuba, including agricultural products. Another consequence of a system of centralized decision making, where the rationale for decisions is dominated by political considerations and economic consequences are disregarded, is the demoralization of labor, indiscipline, and very low overall productivity. Since the state directly controls close to 95% of economic activity, it is very difficult to initiate changes in the absence of major reforms that would allow a free-market type system. Hiring and maintenance of jobs have been dominated by political allegiance and, since the government eliminated most possibilities for engaging in economic activities outside the state sphere, this has contributed to a bloating of employment in the government sector and State enterprises. The low wages paid by the State has been a source of disincentive for individual initiative and contributed to the low productivity of the workers. The government has recognized that there is excess employment in the public sector of about 25% of the labor force. Last year, President Raúl Castro startled the nation by saying that about one in five Cuban workers were redundant and should be let go from their jobs. This is not only a source of inefficiency but involves a tremendous financial burden on the government. Signaling that the days of state protection of jobs must come to an end, Raúl Castro himself has warned that unproductive or underemployed workers in the public sector will have to find other jobs. However, he wants to reduce bureaucracy and raise productivity by easing the government’s role in the economy but preserving the socialist system installed after Cuba’s 1959 revolution. Substantial portions of the goods and services produced are pilfered and distributed through the ubiquitous underground economy for resale or personal use. Thus, the revenues of State enterprises seem seldom to permit higher wage and salary payments. If more is produced, it leaks out of the official economy. In fact, many individuals want to maintain their jobs with the State companies, despite the low pay, because that gives them the opportunity to appropriate goods available at the company (whether finished products or spare parts, tools, etc.). Another problem affecting State enterprises is the lack of adequate accounting systems and management controls. A recent analysis by the newly established Office of the Comptroller General indicates that 37% of State enterprises had a poor or deficient accounting system. According to the same report, corrupt directors and managers of some of these enterprises had utilized a system of duplicate books to conceal misappropriation of funds or the deviation of merchandise or inputs to the black market. At least one Minister, several vice-Ministers and a number of high-level Government officials and administrators of State enterprises have been fired and put in prison for corruption in recent times. A string of recent scandals led economist and long-time Communist Party member Esteban Morales to warn in a column last year that corruption was growing so much it posed a significant challenge to the government. In a society with such low levels of income and the overwhelming presence of the State in all economic activities, the only way for individuals to survive is to take what they can from the State. After all, “the property of the State belongs to all and what belongs to all does not belong to anyone in particular.” To survive, people take whatever you can. It is accepted that people have to “resolver” in order to survive. Contributing to the low productivity is the exodus of the young people and the aging of the population. During four of the last five years, Cuba’s population shrunk, with the proportion of those older than 60 years of age rising to 17.8% of the total population in 2010 compared to 11% in 1986. It is projected that this share could reach 22% by 2020, and 30.8% by 2030, if the current low birth rate (1.6%) is maintained and the exodus of Cubans—in particular young people—continues. At the end of 2010 it was reported that about 332,356 individuals left the country in the period 2000–2009, almost three times the number of annual births for the last few years. Since 1978 the overall fertility rate, that is the average number of children born per woman, has been less than the replacement rate and therein lays the main cause of the aging in Cuban society. The combination of these factors has led to a sustained growth in the number of people 60 years of age and over, a cohort that at the end of 2010 numbered 1,996,632, while the population within the 0 to 14 years of age cohort was 1,946,634, for the first time lower than those in the so-called third age. According to demographic projections, the only age group expected to increase over the coming decades is precisely the cohort of citizens 60 years of age and older. As stated above, by 2030 it will represent approximately 31% of the total population, making Cuba among the countries with the oldest population worldwide. The government recognizes that the current social security system is not sustainable. Over the past twenty years, the deficit in the pension system has risen 733%, and the ratio of active workers to pensioners has dropped from 3.6 to 3.1. In 2009, the deficit of the pensions system was equivalent to 41% of total government expenditures and 8% of GDP. While the pension system was changed in 2008 when the retirement age was raised, this change was not sufficient to make a significant dent to the financial disequilibrium faced by the system. If the age of retirement had not been raised, by 2015 a greater number of workers would have been leaving the workforce than entering it. Such a scenario would have worsened the financial situation of the pension system and significantly increased state social security expenditures. The current demographic situation is not sustainable in a poor nation with such low productivity, undergoing a de-capitalization process, and challenged with meeting the growing current expenditures and investments that an aging population would require. But to turn things around the government would have to adopt policies that create incentives for the young to remain in the island and for those who have left to return and carry out productive employment. Cuba’s government likes to boast that over 85% of Cubans “own” their homes. The claim may be technically correct, however, there is a catch: holding title to a property does not give you the right to sell it. The only legal way to move in Cuba is by swapping residences—a slow, bureaucratic and often corrupt process known as “permuta” (“exchange”), which requires the state to approve the swap of two roughly similar properties. To avoid this hassle, some Cubans instead marry the owner of a property, transfer the deed, and then divorce. Because there are no incentives to build new homes, Cuba suffers from a dire housing shortage. Many buildings have been repeatedly subdivided. In some families, three generations share living quarters. Over the last 50 years, new housing construction has only been around 300,000 units, while the population of the island about doubled, from 5.5 to 11 million. According to the National Statistical Office, in 2010 only 33,000 housing units were built (of which 11,546 by private individuals), not only below the levels planned for that year but also below the 35,000 constructed in 2009 and the 111,000 in 2006. Cubans today live in overcrowded conditions, in old and deteriorated houses largely built before the revolution. The housing situation was further aggravated by the destruction caused by the three hurricanes that hit the island in 2008. For 2011 the official plans call for building some 43,000 housing units. The Cuban government has acknowledged that a lack of housing is one of the country’s biggest challenges. According to official estimates, the housing shortage reached some 500,000 homes by the middle of the past decade. But given the deterioration of the existing stock, independent estimates put the current housing shortages at closer to 1.6 million units. While an urban reform undertaken in 1960 made it possible for tenants to obtain some property rights to the dwellings where they lived through the payment of rent to the government over a 20-year period, these properties could neither be sold nor could mortgages be obtained on them. The limitations on property rights together with the difficulties in obtaining construction materials and other needed inputs has contributed to the lack of maintenance and deterioration of the existing housing stock. To ease this situation, in 2010 the government relaxed rules on forming building companies and buying building materials and more recently has announced a liberalization of the rules regulating the transfer of housing. Inadequate transportation is a nation-wide problem that contributes to the loss of crops and low productivity. To energize the economy and improve productivity it is essential to make significant improvements in infrastructure. In 1958 Cuba ranked sixth in the world with respect to number of automobiles per inhabitant. In 1959, 180,511 automobiles were registered in the island, almost all in private hands and from U.S. origin. Today, 75% of the automotive stock of the country is in the hands of the government, and of the 3.5 million family units only about 1.2% have a vehicle available. In recent years the government has imported a large number of passenger buses, but the majority of them are out of service due to poor maintenance and lack of parts. Transportation of both freight and passengers have experienced many difficulties because of the lack of parts for repairs and spare tires. In addition, many roads are in bad condition as are also rail tracks. Aqueducts are in disrepair because of poor maintenance. The supply of drinkable water has reached a critical situation in many parts of the country, with many of the distribution lines ready to collapse and about 70% of the water pumped being lost on the way to the consumer. Over 100,000 people in the capital area do not have access to running water and depend on cistern trucks to provide them with some supply of water. In 2010, 15.9% of the electric energy generated was lost, an increase of 10.2% with respect to 2009. Losses in transmission accounted for 4.3% of power generated and losses in distribution for 11.5%. While every country experiences some losses in electricity transmission, the degree of losses for Cuba is way above the norm. Some of the losses are attributed to the stealing of energy by customers through illegal hook-ups, but the majority is attributed to the poor conditions of the electricity distribution system. Most electricity generation plants suffer from lack of maintenance and deterioration attributable to the practice of processing high sulfur domestic crude as fuel. In recent years, the government policy was to establish small generation plants that operated with diesel fuel instead of investing in modernizing the old plants, or to develop new sources of renewable energy. Finally, the transmission and distribution networks have been damaged by hurricanes. The deterioration in the infrastructure of the country is the cumulative result of lack of investment and poor maintenance of the existing facilities and a very large effort will be required to turn around this situation. The global financial crisis, compounded by the damage inflicted by three hurricanes in 2008, forced Cuban authorities to run a fiscal deficit of 6.7% of GDP in that year, stop payment of credits received from Spain, China and other creditors, and cut back in many investment projects. Significant limitations regarding the availability of foreign exchange to pay for imports and finance investment projects contributed to a sharp deceleration in economic activity. In order to reduce the fiscal deficit the government adopted a very sharp readjustment in its expenditure plans and implemented a 6% across the board cut in government expenditures in 2009. Expenditure cut backs were further intensified during 2010. Housing construction and maintenance have particularly suffered from the lack of funding, but most other government activities have also been affected. Meanwhile, since 2008 there has been growing monetary injections to cover the domestic fiscal deficit and therefore money in the hands of the public (liquidity) has been increasing, reaching over 40% of GDP; since there has not been a concomitant increase in domestic output, this has contributed to the rise in domestic prices and a decline in real wages. Large and persistent deficits in the balance of payments since 2008 have generated substantial foreign exchange shortages. As a consequence of the combination of an increase in imports, a deceleration of exports, greater obligations to service a growing external debt, and lower availability of external financing, the demand for foreign exchange could not be met. Increases in international market prices, particularly of foodstuffs and fuel, increased the balance of payments imbalance and were one of the factors that triggered the need for a reform of the Cuban government’s economic policies. Given Cuba’s fixed exchange rate, the above-mentioned external pressures ended up affecting the banking system, and the lack of foreign exchange led to substantial delays in making payments abroad for imports and other obligations. Many foreign exporters began to curtail their supplies to the island or demanded payment in advance. In view of the credit crunch, foreign banks cut back their exposure on the island by over 16% in the first half of last year, according to the latest statistics published by the Bank for International Settlements (BIS).2 The total external debt of Cuba to the members of the Paris Club as of December 31, 2010, totaled US$30,471 million, according to a publication of that organization. Outside the Paris Club, Cuba’s largest long-standing creditor is Argentina, with an estimated $1.8bn owed.3 China is rapidly becoming Havana’s lender of last resort, as it recently racked up large loans to Cuba, perhaps as much as US$4 billion, according to some Cuban sources. In response to the deterioration of the balance of payments, the authorities took steps to reduce monetary outflows by lowering travel expenses, suspending imports, postponing investments that required outflows, and limiting the ability of foreign enterprises operating in the island and individuals to withdraw hard currency from their bank accounts. In 2009, Cuba slashed spending on food importing food and other basics by 34% percent, to $9.6 billion, from $12.7 billion the previous year. Further cuts were implemented in 2010. But so far, the moves have not been enough to rein in the deficit. The freeze of the bank accounts of foreign firms operating in Cuba affected not only the image of the country abroad but also resulted in a cut back of short term credits, thus contributing to the fall in imports and the increase in cash payments abroad. The structure and composition of Cuban exports is extremely narrow and there is an excessive dependence of exports of services (such as medical, educational and military services) that have little if any backward linkages. The agricultural and industrial sectors are totally unrelated to the expansion of export of these services, so there is no multiplier effect on the domestic economy. The sugar industry and tourism stopped playing such a role years back, as the sugar industry has practically disappeared and tourism had stagnated in recent times. The global economic crisis also hit tourism. Last year, the number of foreign visitors rose by 3% but the tourism sector’s earnings fell by 10%. Travelers from Canada, the U.S., Argentina and Russia increased, but those originating from the United Kingdom, Italy, Spain, Germany, France and Mexico declined. Travelers from Canada comprise the largest number of visitors from abroad; they reached 945,248 in 2010. The second largest group is Cubans residing in the United States, whose numbers have grown exponentially in the last three years. According to estimates of tourism operators, some 300,000 Cubans living abroad visited the island in 2009 and more than 370,000 in 2010. While tourist receipts were higher in 2010 than in 2009, at US $2,395 million, they are still below the level in 2005. Cuba is currently highly dependent on foreign oil, although recent finds have piqued hopes that the country could one day be a net exporter. Until 1989, the Soviet Union provided Cuba with essentially all of its oil needs and even allowed Cuba to resell some Russian oil. Since the rise of Hugo Chávez to the presidency of Venezuela, that country has been providing Cuba with over 100,000 barrels per day at very advantageous terms. In 2010, Cuba produced about 21 million barrels of oil, approximately the same volume as it extracted the previous year, representing a little more than a third of its annual oil needs. The U.S. Geological Survey estimates Cuba may have up to six billion barrels of oil reserves offshore, enough to meet all of Cuba’s needs and perhaps more. Cuba’s off shore oil reserves represent a significant opportunity for the island and its potential foreign partners in exploration and production. The potential of Cuban deepwater offshore reserves would require 5–7 years to materialize and only if Cuba is able to forge successful technological and financial partnerships with foreign companies. In 2004, Spanish company Repsol drilled an exploratory well off Cuba’s northern coast that was deemed not to be commercially viable. In 2011, the Cuban government announced plans to drill five deep water oil wells in the Gulf as early as the summer 2011. Cuba is perhaps one of the countries in the world that has received the largest volumes of external subsidies over the last 50 years. First, there were transfers from the Soviet Unions, in the form of goods and services (including oil, wheat, fertilizers, steel, and armaments) accounting for more that 30% of its GDP from the 1970s to the collapse of the Soviet empire. The amount of unpaid credits alone from COMECOM countries at the end of 1991 amounted to some 30,000 million “convertible rubles” (the equivalent of more the 100% of Cuba’s GDP at the time). In addition, during this period, Cuba obtained some US$6,000 millions in credits from other governments that the island has not repaid. More recently, subsidies provided by Venezuela have been an important source of financing for Cuba. Cuba receives some 100,000 barrels of crude oil from Venezuela annually in exchange for overpriced medical, military and other services from the island. An estimated 30,000 to 40,000 Cubans are in Venezuela providing all kinds of services to the Venezuelan government. This exchange has a value of over US$6 billion per year. Perhaps the largest source of freely usable foreign exchange for Cuba at this time are the remittances from the exiled community, which in 2010 were estimated to be as much as US$2 billion. Currently there are close to 2 million Cubans living in the United States alone. In addition there are large Cuban communities in Spain, Venezuela, Mexico and other Latin American countries. Many of the residents in these communities have close relatives in the island to whom they send remittances or visit carrying with them significant amounts of money and goods. Cuba has two forms of domestic currency. State employees are paid in pesos “moneda nacional” (CUP), which can be used to pay for subsidized rations, bus fare, additional food items at agro markets, and many forms of entertainment. Foreign currency, such as dollars and euros, are most often exchanged for “convertible pesos” (CUC), which can be used at larger government supermarkets, for individual (as opposed to collective) taxis, and at most clothing and appliance stores. Each convertible peso (CUC) is worth 24 pesos in moneda nacional (CUP) at government exchange houses. Eliminating the dual currency system has been one of the main talking points in the reform debates, but so far little has been done in this regard. The existence of this dual currency system is perceived as a source of discrimination between those that receive payments in one currency versus the other. In particular, while most states employees are paid in moneda nacional, they have to pay in convertible pesos for many items that they buy in the official stores. In a sense the dual system acts as a hidden tax on workers who receive payment in moneda nacional. The maintenance of an exchange rate that is not representative of market conditions has contributed to the problems faced by the banking system and the difficulties in obtaining financing from abroad. In addition, the prevalence of an overvalued exchange rate and a complex multiple currency system makes it nearly impossible to determine the real profitability of various economic activities and results in all kinds of hidden cross subsidies and other economic distortions. Universal free education and healthcare, the two most important achievements of the 1959 revolution that swept Fidel Castro to power, are now facing cutbacks. Investment in education and healthcare has fallen sharply since 2005, according to a Cuban government report. Education was hardest hit: the government invested over 500 million pesos in the sector in 2005, but only 61.8 million in 2010, an 88% drop; investment in healthcare decreased by 81% over the same period. Despite the increase in the number of teachers being trained, there was a shortage of instructors because the low salaries paid resulted in individuals shifting to other activities, like tourism, or leaving the country. Education is far from what it was, as more than half of all classes are now taught remotely (via television) or taught by unqualified teachers. The result has been a very significant rise in the number of students that failed the entrance exams at the universities and poor performance in tests of grammar, mathematics and orthography. Many parents currently pay private tutors for classes in mathematics and science. This would have been not only unthinkable but also quite unnecessary during the period when the state spent more than 15% of GDP on education. The “municipal universities” and “emerging teachers” programs proved to be expensive propositions that yielded very poor results, and therefore the government has quietly dismantled them. There has also been a bias in the educational system in favor of training in the social sciences as opposed to mathematics, engineering and agriculture. Some career streams, like economics, accounting and business administration, had been practically eliminated. The government attempted to fill this gap with young people that were given a quick training course, the so-called “emerging teachers program,” but graduates of the program proved not to be appropriately trained and there was a sharp decline in the quality of the graduating university students. Subsequently the government offered incentives for retired teachers to come back to teach, but so far this has not proven an effective way to deal with the problems in the education system. With respect to healthcare, while the ratio of physicians per 10,000 inhabitants doubled between 1989 and 2010, about one-third of them have been sent for service abroad, the majority to Venezuela. The government program to export medical services to other countries, while providing Cuba with a source of foreign exchange, has been carried to such an extent that there are now shortages of physicians and medical services at the local level. Moreover, except from some chosen facilities that tend to the political nomenklatura and foreigners who are willing to pay in hard currencies, most of the local healthcare facilities experience shortages of the most elemental supplies. Many medications are not available or can only be purchased at very high prices in the pharmacies that sell in foreign exchange. While the government puts an emphasis on continuing to excel with respect to some health indicators that receive much attention at the international level, such as life expectancy and infant mortality, they have disregarded the deterioration of the water and sewerage systems, and this has brought a resurgence of a number illnesses that at one point had been practically eliminated. There also appear to be inconsistencies between some of the available healthcare information that raise troubling questions. For example, while the infant mortality rate is very low, maternal deaths and abortions are reported to have increased sharply, and there are reports that patients are advised to have an abortion if there is any likelihood of a high risk pregnancy. Moreover, one has to wonder why in a country with an aging population, the number of hospital beds available has decreased by 25%? Since he took over from his brother, Raúl Castro has acknowledged that the Cuban economy is not functional and there is need for important structural changes.4 At the beginning he moved slowly, while he consolidated his control over the political machinery of the State, probably fearing a negative reaction from nomenklatura members who were likely to be affected by the changes. Initial efforts concentrated on cutting waste from the government and state enterprises, promoting import substitution and reducing consumption of expensive imported energy. At the same time, he undertook a purge of individuals who that may not follow his leadership throughout the governing structure, placing an increasing number of members of the military in key economic management positions. More recently he has taken what are seen by some as bolder steps to seek a reform of the system. A number of measures have been taken to scale back the state’s near-total dominance of the economy, while attempting to generate new revenue for a government short on cash. The plan includes bringing out of the shadows illegal private businesses already operating and taxing them, leasing fallow state lands to private farmers, loosening the regulations to allow farmers to sell directly to consumers instead of only to the state, issuing micro credits to some farmers for purchasing farming equipment in authorized stores rather than on the black market, adjusting salary scales to be more responsive to individual productivity of the workers and eliminating caps on worker earnings, cutting back on employment by the State and on subsidies, granting new licenses for family businesses and other self employment activities to allow them to operate legally, and promoting joint ventures with foreign investors—under the control of the State—in those activities that are most profitable, such as tourism, mining, and oil exploration. Some observers consider that these are important steps in the right direction; others think that the steps are too timid and too late, and they will not be adequate to resolve the current crisis. Changes introduced over the past year, including the right to engage in self-employment in 178 approved job categories, has been billed by some as a wide new opening for entrepreneurship, on an island of 11 million people where the state employs more than 90% of all workers and controls virtually all means of production. In reality, many of the new jobs—from food vendor to wedding photographers, manicurists to construction workers—have existed for years in the informal economy, and many of those seeking work licenses were already offering the same services under the table. As of the end of 2009, there were 143,000 selfemployed workers already licensed, although thousands more worked for themselves illegally. Moreover, about two-thirds of the 171,000 new business licenses granted so far this year went to people who were already out of work, suggesting that the reforms may not be enough of a safety net for the half-million people who are expected soon to be out of a government job. The new measures give these individuals the opportunity to legalize their activities, but to do so they must register with the government and be subject to taxation. The liberalization measures are designed not only as an attempt to create job opportunities for individuals losing their State jobs, but as a way to try to control the black market and capture some additional revenue for the government. Paradoxically, the expansion of a legal free market might result in an increase in the size of the black market, particularly with respect to goods and services the new entrepreneurs need and the government is either unwilling or unable to supply. The number of authorized self-employment activities is still very small and any activity not listed is forbidden and illegal. In particular, no professional activities have been authorized, nor any activity involving sophisticated technologies. The existence of many very detailed and strict rules that regulate the permitted activities leaves little room for personal initiative and the continued presence of price controls is a disincentive to increased production. Violations of rules can lead to high fines and/or suspension of licenses to continue the activities. Such a heavy-handed system of controls tends to promote corruption. Cuba plans to turn some state-owned, small-scale manufacturing and retail services into cooperatives as the state retreats from minor businesses. The new framework also would allow the new cooperatives to function as mid-sized companies with many employees, a key requirement of any vibrant economy. Currently, such entities only exist in agriculture. The newly-released version of the guidelines allows such employee-owned businesses to directly sell products to consumers or business owners, without the state operating as an intermediary. The cooperatives would also be free to decide how much each worker gets paid—presumably in relation to his or her productivity and usefulness. However, the state will still own the cooperatives’ premises, as it does most property in Cuba, but the workers will be allowed to run them, pay operating costs and taxes and keep profits. To help address the housing shortages, the Government has announced that licenses to allow self construction of private housing by individuals will be authorized. While some bureaucratic hurdles will be eliminated—for example, transactions can be completed using a notary public without having to seek prior authorization, family members will be able to inherit property even if they are not living in the premises—others remain, for example, individuals will still not be allowed to own more than one home, the sales transactions will be taxed, and individuals will have to prove that the money for the transactions comes from legitimate activities. As part of the overall reforms, the government has been trimming its social safety net, warning Cubans that the country’s cradle-to-grave entitlements— from free education to health care—can not be sustained at current levels of economic output. Even the island’s ration book, a keystone of Cuban socialism, is being winnowed away amid rumors it may be eliminated altogether. 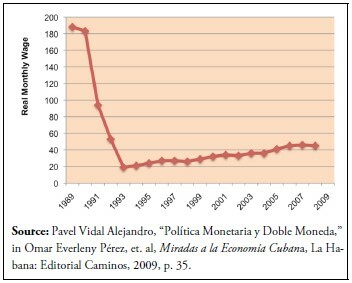 The level of “real wages” (inflation-adjusted wages) in the official economy collapsed after 1989 and have not recovered significantly since then, according to estimates from the Centro de Estudios de la Economía Cubana. Since the government uses extensive price controls and even regulates prices in the limited areas of free-market activity, the price index may underestimate underlying inflation. Moreover, the official inflation index, which registered an increase of 1.4% at the end of 2010 compared to a year earlier, fails to reflect fully the rise in the cost of living arising from the shift of goods away from the rationing system and toward a greater reliance on markets. It should be noted, however, that in addition to wages, some individuals have other sources of income, such as remittances, income from legal self-employment regarding production of goods or services, underground economic activities, income supplements paid to workers of foreign operated joint-ventures, goods in kind distributed by the State, and widespread pilferage. During the last two years, the government has taken a number of steps to reduce local subsidies and introduce new taxes in order to reduce the fiscal deficit. This has involved removing a number of products from the subsidized “rationed family basket” (libreta de abastecimiento). Thus, Cubans have seeing their ration cards get thinner and thinner. The cutbacks in state subsidies over the past year—especially in the rations cards—already have increased the cost of living. Hit especially hard have been retirees, the disabled, widows and others who live on fixed incomes, and the 40% of Cubans who do not receive remittances from abroad and must rely on salaries that officially average a mere $20 per month. One way in which the government expects to be able to generate more resources to finance its activities is through the tax system. Recently-announced new taxes will require Cubans to pay more than a third of their income to the state, while those who create businesses and hire their own employees will pay even more. Rules recently published detail four kinds of taxes for individuals and businesses: (1) a sliding personal income tax; (2) a sales tax; (3) a public service tax; and (4) a payroll tax. It also establishes minimum monthly fees for different kinds of businesses, as well as deductions Cuban can take to reduce their tax burden. many private activities for which there is a large demand (especially those involving professional and technical knowhow) are still prohibited. In addition, there continues to be tax discrimination favouring foreign firms in joint ventures. The main difference is the determination of the effective tax base, which is calculated as total revenue minus costs of production for foreign firms, but for micro-enterprise is gross revenue minus an arbitrary and limited allowable level of input costs. As a result, the effective tax rates for foreign enterprises calculated as given above are reasonable but they can be unreasonable for Cuban microenterprises as they could reach or exceed 100%. Many of the 313 recommendations in the newly-approved Policy Guidelines are fairly obvious, trite and constitute general statements of reasonable economic management. Moreover, some of them have been made repeatedly over a number of decades, including those relating to the expansion and diversification of exports, science and technology policy, the sugar agro-industrial complex, or the development of byproducts and derivatives from the sugar industry (an objective at least since 1950). Restating many of these as guidelines cannot do much harm, but certainly does not guarantee their implementation. There are also opaque elements among the guidelines and apparent contradictions, as some of them stress continuity of state planning and control, while others emphasize private activity and greater enterprise autonomy. The Guidelines reflect an intention of maintaining the state-owned enterprises as the center of the national economy, although they recognize a role for foreign investment and other types of property, such as cooperatives, small farm operations, usufruct, leases, independent workers and others. However, they continue to ban the concentration of property in the hands of individuals or legal entities, tightening restrictions on private property even further, since this criterion extends not only to new private enterprises, but also to those which existed previously. Perhaps the most serious restriction is that forms of activity that are not specifically permitted are prohibited, including virtually all professional activities. As pointed out by Cuban economist Pavel Vidal, the authorized activities are not knowledge-intensive and thus fail to take advantage of the investment in education that the country has made over the past decades. The restrictions placed on the use of the land turned over to private farmers in usufruct have so far failed to bring about a turnaround in agricultural production. The property remains in the hands of the State, mortgages are not available to finance working capital, and there are no incentives to make long term investments. While the Guidelines create some space for private economic activity, overall control remains in the hands of the armed forces and the military men close to Raúl Castro. It would be important for civil society rather than the armed forces to control economic activities. Currently GAESA (Grupo de Administración Empresarial, S.A.), the holding company of the Armed Forces, controls almost 70% of the country’s economy through some three hundred enterprises that generate almost 90% of exports, 60% of tourism income, close to 25% of income from services, 60% of receipts in foreign exchange, and more than 65% of all the retail sales using convertible pesos. Military security is the only area of the state budget where there have been no cuts in expenditures, and in fact military expenditures have increased. In some sense, the reforms pass the cost of the adjustment to the population at large, by getting rid of excess employment on the state’s rolls and raising revenue through taxation, buying the ruling class some time in the hope that there will be a significant discovery of offshore oil deposits. The Guidelines seek to perfect a dysfunctional model while walking a fine line: they promote a private sector that will have to absorb more than one million unemployed workers to be released from the public sector (excluding coercive and security agencies, where employment has grown), yet warn that concentrating property/capital in private hands will not be permitted. It remains to be seen if the Government will be prepared to create the legal framework to protect the new private sector, or instead will prolong the status quo by adopting ambiguous reforms under continued strong State control. Of particular significance will be whether the Government will allow prices and wages to be determined by the market or will continue to seek to control them. There is no question that reform is needed. Cuba is the one country of the Americas that has had not one, not two, but six lost decades, experiencing a deterioration of living conditions relative to its peers steadily since the mid 1950s. Something must change. However, the current reforms will not do the trick. This is not because the reforms are, economically speaking, too modest (which they are), but because the most vital political factor that is required for market reforms to be effective is still missing— societal trust in the state. Cubans mistrust the state for a simple reason: every time the state has allowed an economic opening, sooner or later the authorities have unilaterally taken those liberties away, and ended up punishing those who took advantage of the small breathing space that had been provided. Brief reforms have allowed the state to weather momentary fiscal crisis, but when the fiscal crisis subsided the state re-imposed draconian measures. This kind of reversal has taken place no fewer than four times during the Revolutionary period. Totalitarianism is the way that the Cuban state conducts its business. Cubans have learned not to trust it. The current reforms do nothing to strip the state of the capacity to act arbitrarily. Until this change, it is hard to imagine that this round of reform will be more than another failed déjà vu. In July 2007 Raúl Castro called “absurd” the state milk collection and distribution system and said that farmers should deliver the product directly to local consumers where possible. Prices paid for milk to farmers were increased. In August Castro signed a law ordering all state companies to adopt a system of “perfecting” management, using capitalist-style management techniques that had been used in the military. In March 2008, computers, cell phones, DVD players and electric appliances went on sale to the public for the first time, and bans on Cuban citizens renting cars and staying in tourism hotels were lifted. In addition, a sweeping reform of agriculture began. These included: decentralization of decision-making, orders to state bureaucrats to stop favoring state farms over private farms, increases in state prices paid to farmers, leasing of fallow state land to private farmers and loosening of regulations on farmers selling directly to consumers instead of to the state. In August, a labor reform was announced that sought to tie an individual’s wages to his or her productivity, not company performance, and caps on earnings were eliminated. The government announced domestic freight transport and housing construction would be decentralized to the municipal level. In March 2009, Raúl purged his brother’s economic cabinet and placed trusted military men in key economy and planning posts. The Central Bank head was replaced two months later. Also, a number of State enterprises were closed and some government offices consolidated. In April, the new cabinet slashed the budget and imports, the first of a series of adjustments, and plans were unveiled to develop suburban farming around most cities and towns, using mainly private plots. In June, Decree Law 268 authorized that individuals could hold more than one job. In September, licenses were issued to food vendors in various cities, allowing them to operate legally. Studies began on converting some small retail services and manufacture facilities to cooperatives. In October, the newspaper Granma announced that lunchrooms of state enterprises would close and in exchange workers would receive a daily stipend to help them pay for their lunch. In January 2010, municipal governments were ordered to draw up economic development plans that could include cooperatives and small business. A pilot project was begun whereby taxi drivers could lease cabs instead of receiving a state salary began in Havana. In March, the convertible peso (CUC) was devalued by 8% vis-à-vis the U.S. dollar. In April, barbershops and beauty salons with up to four chairs were turned over to employees in the form of a lease, the first time state retail establishments have been handed over to employees. Rules for home construction and improvements were liberalized. In June, sale of construction materials to the population was liberalized, and the government authorized farm cooperatives to establish mini-industries to process produce. In August, new rules authorized Cubans with small garden plots to sell produce directly to consumers at roadside kiosks. Also, the state increased from 50 to 99 years the time foreign companies can lease land as part of tourism and leisure development projects, such as golf courses and marinas; and stores were opened where farmers can purchase supplies in local currency without regulation. In September, the government announced a slashing of the number of people on the government payroll. The plan was to cut one million workers over a five year period, including 200,000 in the first year. To help the transition, 250,000 new licenses would be authorized for the creation of family businesses and other self employment activities, regulations governing self-employment would be significantly loosened, and family businesses would be authorized for the first time to hire labor and rent space. Also in September a Communist Party document (Lineamientos de Política Económica y Social), proposing economic and social policy guidelines for the country, was circulated. It envisioned a radically revamped Cuban economy, with a new tax code, newly legalized private cooperatives and a state payroll no longer burdened by at least a half-million idle or unproductive workers. The document indicated that taxes would be collected on wages, sales, and social security payments to retirees, and on small businesses that employ people. In January 2011, State banks began issuing microcredit to would-be farmers who have leased land. Loans to persons authorized to operate private businesses could also be issued to finance working capital and investment. In March, Castro announced that the original timetable to lay off 500,000 state workers had been scrapped and created a new post to oversee the economic reform, naming Economy Minister Murillo to the job. In April, a somewhat revised set of Lineamientos de Política Económica y Social were approved by the Congress of the Communist Party. Also, Cuba began to allow foreign investors to lease government land for up to 99 years to build gulf courses, luxury housing, and other tourist oriented facilities. In May, the Council of Ministers agreed to take steps to extend the authorization to hire workers for all private sector activities and to “continue with the relaxation process regarding independent work.” Since then, the government has been discussing a possible moratorium on the collection of taxes from independent workers. More recently, Cuba has announced the first details of a highly anticipated new law meant to loosen rules on the buying and selling of homes and cars, which have been tightly controlled since soon after the 1959 revolution. The law is still being crafted and, according to the Communist Party newspaper Granma, would take effect by the end of the year. The rules are meant to help ease a severe housing shortage and legalize unofficial title transfers that are commonly used to skirt the state’s rigid rules. The government will also do away with rules under which only pre-1959 automobiles could be freely bought and sold, and individuals will be able to own more than one vehicle, regardless of the model year. 1. Independent sources have estimated hidden unemployment as high as 34% in the 1990s and over 20% of the labor force more recently. 2. According to the BIS quarterly report, foreign banks had outstanding short term claims of $1.581 billion in Cuba as of the end of June 2010. Fifty-five percent of that amount was due in one year or less; 26.7% in two years or more. Cuba’s biggest lenders by far are European banks (the BIS reports break down the data by nationality, not individual banks), accounting for 76.28% of total outstanding claims. French banks lead the pack, with $475 million worth of loans (or 30% of the total), followed by Spanish banks ($373 million), and German banks ($146 million). 3. This debt dates back to 1973, when Argentina under the short-lived government of President Héctor Cámpora offered some commercial credits to Cuba for the purchase of Argentinian products. 4. A chronological summary of the main measures is given in an Addendum.